The precision filter, also known as cartridge filter housing, is used to prevent impurities like particles from entering high pressure pump and reverse osmosis membrane module. The filtration precision ranges form 0.10μm to 60μm and it is free from influences feed pressure fluctuation. When the operating differential pressure of this security filter is above 0.07Mpa, users should replace or clean the filter elements. The structure of this filter makes replacement of filter element quick. The precision filter (cartridge filter housing) is a security filter whose output is 3M3/H. 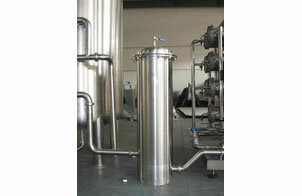 The filter is equipped with 7 polypropylene filter elements whose precision is 5um and length is 5um. Its husk is made of stainless steel 304. Jiangsu Topling Machinery Co., Ltd is a professional manufacturer and supplier of precision filter (cartridge filter housing) in China. Apart from precision filter we still have other products: bottled water filling line, juice filling production line, carbonated drink filling line and related equipments including membranes ultrafiltration filter, ozone mixing tank, decapping machine (cap removing machine, 5 gallon bottle decapper), etc. All of our filling lines have got the standards of CE, and ISO9001-2008. With good quality and affordable price, Our company successfully offers many production lines for many well-known brands at home and abroad, such as Coca Cola, PEPSI. If you need precision filter, please contact us.